Westview Village, or Westview Village Manufactured Home Community, is a neighbourhood located in west Edmonton, Alberta, Canada. A manufactured home community, it is located on the west side of Winterburn Road (215 Street) at 107 Avenue NW. It is surrounded by Winterburn Industrial. Westview Village had a population of 2,242 according to Edmonton's 2012 municipal census. Over half the homes in Westview Village (54.2%) were moved into the park during the 1970s, with a small percentage (4.2%) predating 1970. After 1980, the number of new homes being moved into the neighbourhood dropped off, with roughly 150 homes being moved into the neighbourhood in each of the following decades. The majority of the homes in the neighbourhood are manufactured homes, though there are a few duplexes. Owner-occupancy is high, with roughly 97% of homes being owner occupied. The community is represented by the Westview Village Community League, established in 1985, which maintains a community hall and outdoor rink located at West View Boulevard and West View Crescent. In the City of Edmonton's 2012 municipal census, Westview Village had a population of 2,242 living in 1,076 dwellings, a 3.1% change from its 2009 population of 2,174. With a land area of 0.92 km2 (0.36 sq mi), it had a population density of 2,437 people/km2 in 2012. 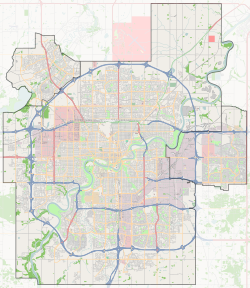 ^ a b "City of Edmonton Wards & Standard Neighbourhoods" (PDF). City of Edmonton. Retrieved February 13, 2013. ^ "Edmonton Developing and Planned Neighbourhoods, 2011" (PDF). City of Edmonton. Retrieved February 13, 2013. ^ "The Way We Grow: Municipal Development Plan Bylaw 15100" (PDF). City of Edmonton. 2010-05-26. Retrieved February 13, 2013. ^ "City of Edmonton Plans in Effect" (PDF). City of Edmonton. November 2011. Retrieved February 13, 2013. ^ a b c "Neighbourhoods (data plus kml file)". City of Edmonton. Retrieved February 22, 2013. ^ "Westview Village Census" (PDF). City of Edmonton. Retrieved 7 October 2012. ^ "Westview Village Community League". Westview Village Community League. Retrieved October 14, 2017. This Edmonton Metropolitan Region location article is a stub. You can help Wikipedia by expanding it. This page was last edited on 14 October 2017, at 22:55 (UTC).